Uniferon is an iron supplement for piglets that promotes better health and faster growth. With a full 200 mg of iron in each 1 ml injection, Uniferon will help keep your piglets healthy, reduce the risk of iron deficiency anemia, and support a faster growth rate right up to slaughter - and it does this all with just one dose. 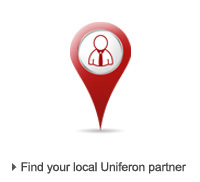 Uniferon from Pharmacosmos is also simple and fast to administer, so it will save you time and money. Uniferon® is a registered trademark of Pharmacosmos A/S. All rights reserved. Please choose your site below.